holders. 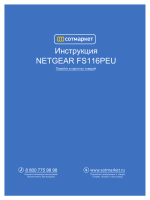 В© 2011 NETGEAR, Inc. All rights reserved. readers with intermediate computer and Internet skills. malfunction or damage to the equipment. Note: Product updates are available on the NETGEAR, Inc.
GS110T Smart Switch is a supplement to the Gigabit Advanced Smart Switch family. 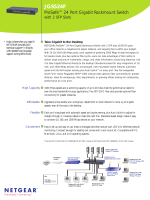 Using Gigabit ports, high-speed connections can be made to a server or network backbone. 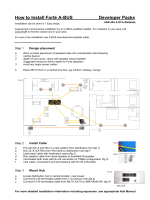 complete package of features for the observation, configuration, and control of the network. network requires the Netgear Smart Control Center program, a utility that runs on a PC. latency for high-speed networking. All ports can automatically negotiate to the highest speed. Standard NTGR 1xx series chassis. Figure 1 shows the package contents of the NETGEAR GS110T Smart Switch. Figure 3 illustrates the GS110T back panel. RJ-45 port. Each SFP port has its own indication LED. вЂў Off = No 100 Mbps link is established on the port. вЂў Solid Green = A valid 100 Mbps link is established on the port. вЂў Blinking Green = Packets transmission/received on the port. вЂў Off = No 10 Mbps link is established on the port. вЂў Solid Green = A valid 10 Mbps link is established on the port. вЂў Off = No 1000 Mbps link is established on the port. Table 2 describes the system LED designations. twisted-pair (UTP) cable terminated with an 8-pin RJ-45 plug. the port to a router, switch, or hub). straight-through cables when attaching devices. paper clip into the opening to press the recessed button for two seconds. and 1000 Mbps hubs and switches. port connected to the server or PC can provide 2000 Mbps throughput. sunlight, warm air exhausts, hot-air vents, and heaters. The GS110T Smart Switch can be used on a flat surface or mounted on the wall. correspond to the slots on the bottom side of the GS110T, then mount the switch. using either straight-through or crossover cables. on the back of the switch. the power source is good. If this does not resolve the problem, refer to Appendix A.
Manual on the Smart Switch Resource CD. performance degradation setting on the switch and auto-negotiate. software driver has been installed. switch only determines the speed correctly and the duplex mode defaults to half-duplex. provided that the attached device supports auto-negotiation.